I’ve been trying to be more positive these days, after a rough few years, though that positivity takes a hit every time I get into a car with a touchscreen. That’s because touchscreens in cars are bad and even dangerous—a failed experiment. Admittedly, we’ve had some mixed opinions on touchscreens in cars over the years. I was surprised, for example, to learn that Jason Torchinsky is stridently pro-touchscreen, while Jalop alum and seasoned tech reporter Damon Lavrinc is definitively not. All I know is what my fingers and eyes tell me, which is that every time I use a touchscreen in a modern car it ends up being a confusing and enraging experience. You might have experienced some of the same issues: You press the screen intending one thing to happen, and something else does, either because your fingers are too large, the screen itself is poorly engineered, or both. Or there’s unacceptable lag, or the menu layouts are inherently not conducive to being navigated by hand. All of which means I was delighted with the new screen in the 2019 Mazda 3, as it is intentionally NOT a touchscreen, Matthew Valbuena, a Mazda engineer, explained to me last week. It’s classy, even. (The previous generation’s touchscreen is on top of this post.) And while the new one’s a little short, it gets the job done, and does something that touchscreens don’t do at all, which is help the driver focus. Because when you’re banging away at your touchscreen, you’re leaning over trying to focus your eyes and brain on what you’re doing. Valbuena said that Mazda even has data that shows that people who use their touchscreen mid-drive also frequently inadvertently turn the wheel. And while most touchscreens won’t let you do every function mid-drive, enough of them let you do some functions, and leaning and pushing on a screen that may or may not work very well has never been ideal. Mazda’s solution is to take us back to a time before touchscreens, with a knob in the center console that you barely have to move at all to operate. It’s not the first to do this, of course. 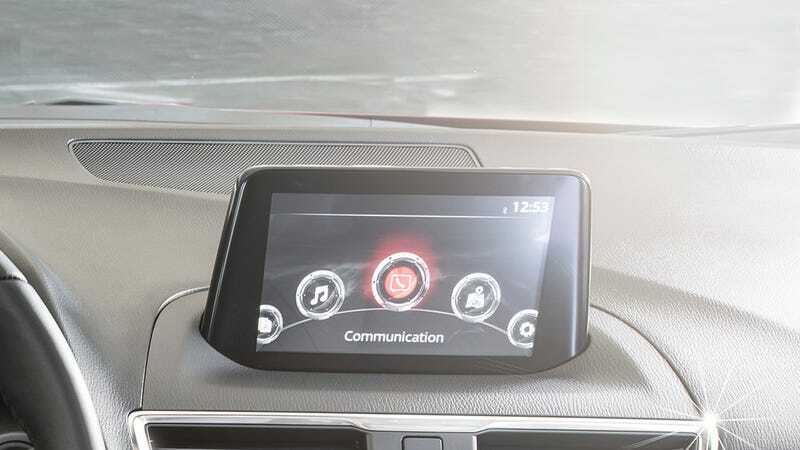 BMW didn’t have touch screens until fairly recently, making all drivers operate the system solely though its iDrive knob and associated buttons. Lexus does not use a touch screen at all on its newer cars. Some of the latest Audis use a variety of interfaces. Part of Mazda’s testing, in fact, involves blindfolding a person, sitting them in the driver’s seat, and surrounding them with engineers who then observe how well the blinded person finds all of the controls. Perhaps because of this, the screen control you could probably find blindfolded, or, more practically, you can find it without your eyes leaving the road. In a similar vein, Mazda also did a few other smart things in the new 3 to cut down on distractions, like only putting driving information in the instrument cluster, and not stuff like what song you’re listening to, or other extraneous information. The heads-up display, meanwhile, sits further back visually, like the main screen. That’s to lessen the amount of refocusing your eyes have to do to look at both of them. Because getting frustrated with your touchscreen and then having to refocus your eyes for the road is the worst of all worlds, and every second counts. You may reply that entering addresses using a knob is almost as infuriating as using a bad touchscreen, and I would say that you’re right, but voice control, implemented properly, is a good solution for this. Mazda’s voice control seemed ... fine, in the little bit of testing I got to do with it, but I’m aware other systems can be hit or miss. I’m interested, though, in your thoughts. Do you like touchscreens? Hate them? Do you prefer that every car have a Blaupunkt from the 1980s instead? The last one is a hard ask these days.